A lot of people have said to me “How do you paddle a kayak?”, usually with a confused expression on their face. 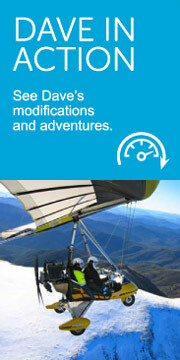 In this blog I will discuss my kayak modifications and how I paddle. I have a Prijon Kodiac Sea Kayak, 5.2 metres long. Although I will be on a river and it turns like the Titanic, these types of kayaks are more efficient for long distance paddling. I tried many different brands, but the challenge for me was being able to get in it! Some required Houdini manoeuvres to thread my floppy, unwilling 6 foot 4 body into the cockpit. I settled on the Kodiac as it is one of the faster plastic expedition kayaks but the large keyhole cockpit was what sold me. With one person and a hoist, I can be lifted in and out with ease. I also preferred plastic as it’s more robust. At times I need to get dragged into the water from a bank, and I didn’t want to be worrying about damaging it. With my disability, everything has to be modified before I can use it. Even something as simple as a kayak required significant modifications and a lot of trial-and-error to allow me to paddle. When I sat in a sea kayak for the first time, I was upside down looking at fish within a nanosecond. I have no balance, as I have no movement from my armpits down. 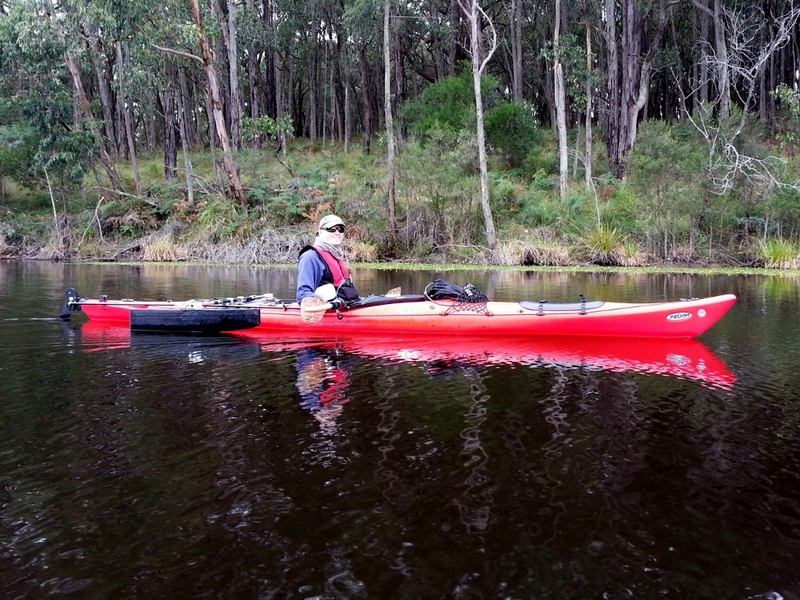 To be able sit upright in the kayak required some form of support system – outriggers! 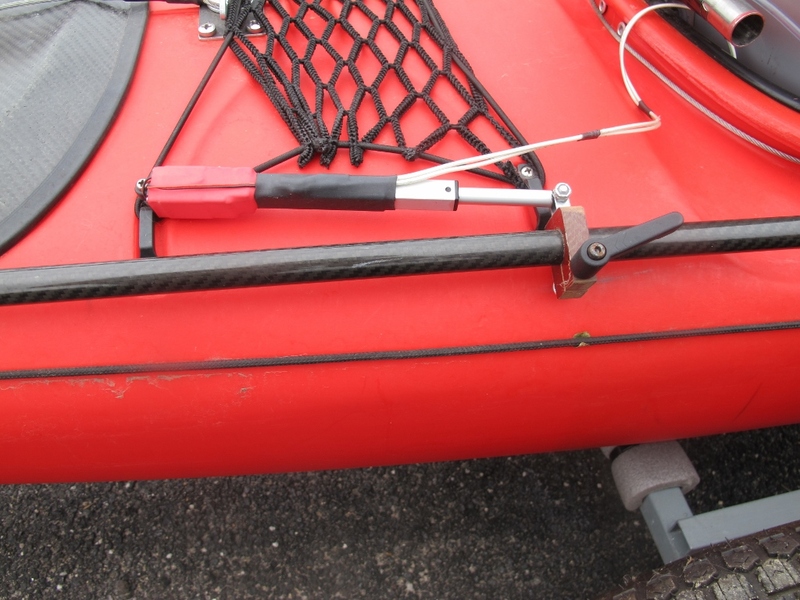 At the time there were no suitable outriggers available for what I needed, so I developed my own to provide good stability stopping the kayak from rolling over. Each outrigger is 1m long, 150 mm wide at the widest part, and 150 mm high. They are constructed with a foam inner, covered with fibreglass and strips of carbon fibre for strength. The two outriggers are mounted on the rear compartment hatch, far enough back to avoid my paddle. When the kayak is level in the water, the bottoms of the outrigger are slightly above the water surface to minimise drag. When I paddle, they dip in and out, providing stability. Seating for any spinal injured person is one of the most critical elements to avoid pressure sores. It also needs to be comfortable enough for a long period of time in the seat and hold you in the right position to paddle effectively. I removed the existing seat and started from scratch. It has taken me 2 years of fiddling to get it right. Well, as right as it can be! 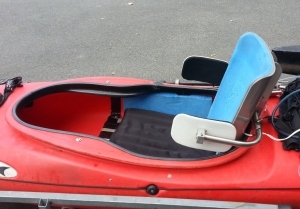 I have a piece of closed cell foam, shaped to fit the floor of the kayak with the rear starting at 10 mm increasing to around 70 mm at the front to put my seat on a slant for balance, and help distribute the pressure of sitting from my bum to my thighs. On top of the foam, I have a special air cushion called a Roho that is designed to minimise pressure sores. The sides of the kayak seat are packed out with foam to hold my hips central. A high backrest with side supports keeps me balanced so I don’t flop around like a limp sausage. My feet press against a plastic foot plate where the rudder pedals used to be, to keep them in place. 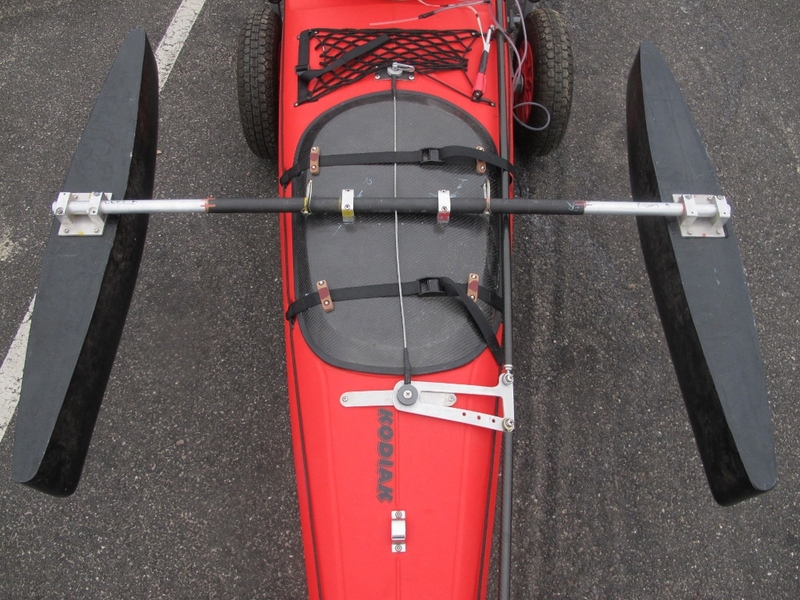 For the traditionalist kayaker, one may scoff at the thought of relying on a rudder to manoeuvre the kayak. I like the idea of being a traditionalist, but given my situation, the rudder makes my life so much easier, allowing me to paddle a continuous rhythm while navigating around bends or avoiding rowers on the Yarra. 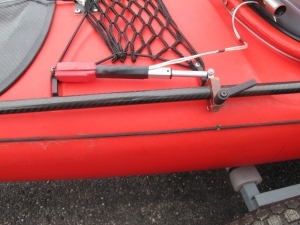 It’s also invaluable in windy conditions, keeping the kayak straight. The rudder is normally operated using the feet. I have taken the sip/puff technology from my Jabiru aircraft and adapted it to the rudder on the kayak using a small electric actuator and a 12 volt battery to power it. Sipping turns the rudder left, puffing turns it right. It’s really easy and works a treat! I can operate it manually if the actuator fails, by disengaging it by a clamp. By knocking a small lever with my elbow, I can push a rod forward and backwards operating the rudder. You wouldn’t think there is much to consider for the paddle but this simple device is the most important piece of equipment. This is the thing you need to lift to shoulder level and pull back thousands of times, pulling the kayak forward. Experts say if you’re going to skimp on something, skimp on the boat, not the paddle! When I first started paddling, I soon realised how true that was! 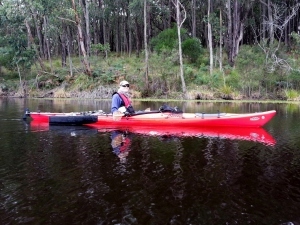 My first paddle looked really cool with bright colours, reasonably light, with a mid-sized blade that most people use. My first problem was that I’m not most people of course, with my limited arm function. The weight of the paddle and the size of blade put a lot of strain on my arms and shoulders burning them out very fast. 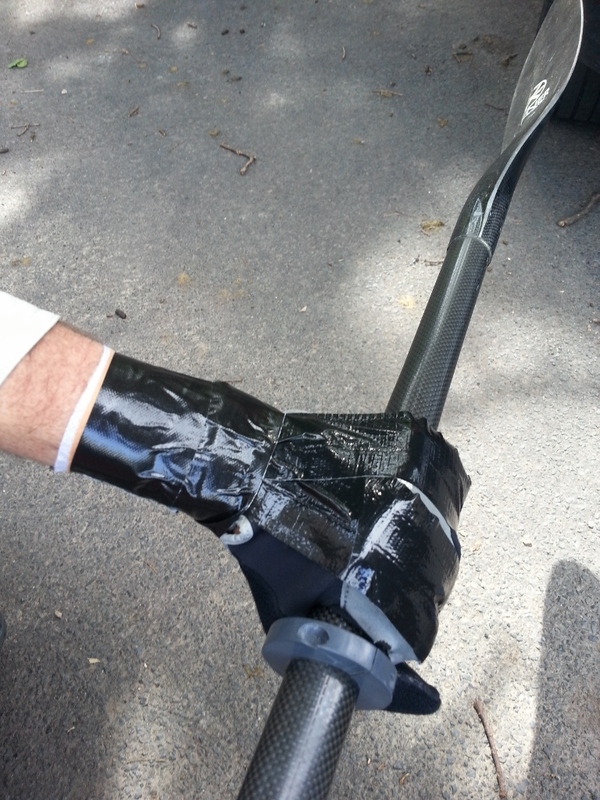 I needed the lightest paddle I could find, but the real turning point for my paddling was having a smaller blade. A smaller blade gave me a higher cadence (paddle speed) alowing me to maintain a constant paddle rate without fatiguing as quickly and putting less strain on my shoulders. The Werner Athena is extremely light at around 600g and the smaller blade is far better for my endurance and wear on my shoulders. But, how do you grip the paddle without finger function? Duct Tape! I experimented first using wrist cuffs that locked onto a plate on the paddle, but these were just too heavy without a paddle support (I later developed a paddle support but found it less efficient with the rowing motion. It’s a good solution for people who don’t have the strength or movement to support the weight of the paddle!). The simplest ideas are usually the best and I went back to my original plan, which I also use to grip the cranks on my hand cycle – duct tape. Its light, provides flexibility allowing my wrist to bend, but most importantly it forms around my fingers to replicate a grip; either loose or tight, to hold the paddle. Am looking forward to following this new venture. Good luck and happy paddling. 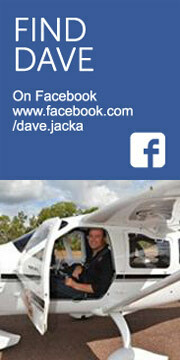 Thanks Alison, thanks for following. I can’t wait to get going. Best of luck for your new adventure Dave, I know you’ll do your best as you did in 2013 . the kayak hasn’t got an oil filter has it? but then the Murray is not as wide as Bass Straight . as far as I know there’s no croc’s or sharks in the Murray but watch out for the bloody trees. See you in Yarrawonga.